Disclosure: This is a press sample. All opinions are my own. What is Beautiful Madness Bookcase? : Beautiful Madness Bookcase is a brand new subscription box for book lovers like me! 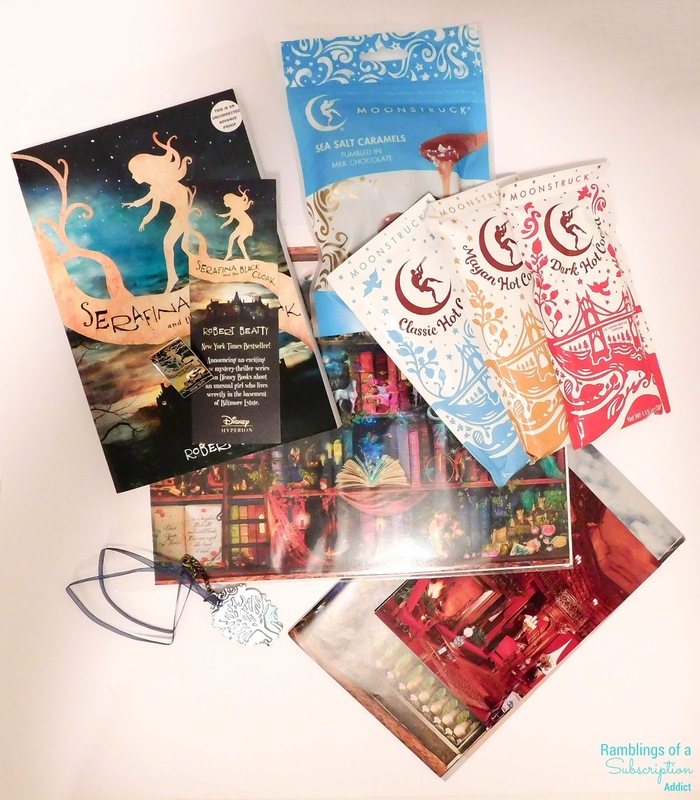 Each box will include a box, a snack & drink, extra goodies that are wearable/usable/displayable, and an insert card bookmark! How Much is Beautiful Madness Bookcase? 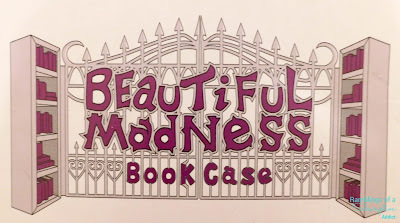 : Beautiful Madness Bookcase is $40 + shipping. It is currently only available in the United States, but stay tuned to see if it becomes available in your country! This box is still in the 'Coming Soon' phase, so make sure to sign up for when it becomes available. The box it comes in is pretty large. It shipped Priority 2-Day, and so it arrived very quickly! 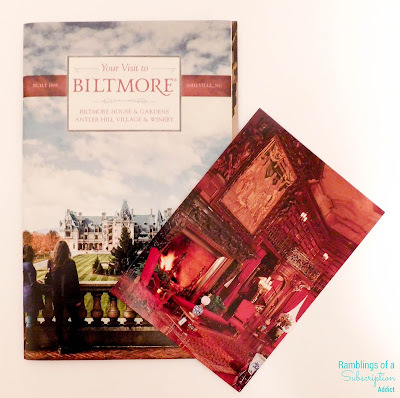 This is the insert/bookmark! It's actually the info card on the back, but I always need more bookmarks because I feel like mine always go missing. The Library at Biltmore Postcard ($0.55) - The theme of the book is centered around the Biltmore, so this postcard is a great little addition. I was confused slightly until I read the book, but it all went together in the end! 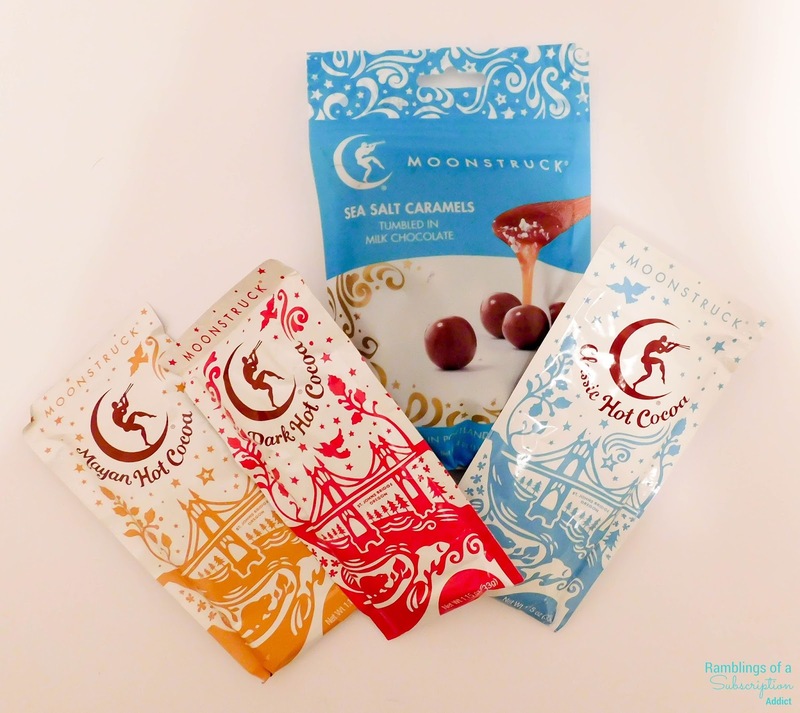 Moonstruck Chocolates (Sea Salt Caramel) ($5.00) - I usually wait until husband tries chocolates before I do, I'm nice like that, but I just couldn't wait with these. The caramel is so(oooooo) smooth and the chocolate is the perfect touch. After checking out their website, I found that they do dark chocolate covered blueberries which I feel like I need my weight in! Moonstruck Hot Cocoa Trio ($6.00) - This actually includes all three flavors that Moonstruck offers: Classic, Dark, and Mayan. I'm a fan of dark chocolate while husband is all about classic cocoa, but the Mayan was an interesting blend of sweet with the slightest spice. How can you go wrong with drinking hot cocoa while reading? 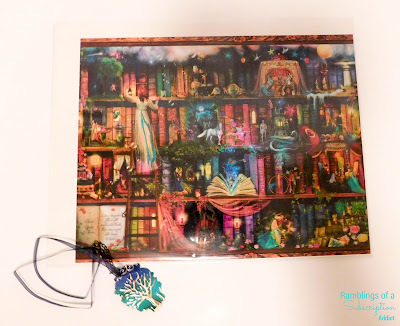 Treasure Hunt Art Print ($10.00) - This is such a gorgeous print. I am not one to frame too many things I get, they usually don't match what I have in my opinion, but this is so gorgeous and it will be perfect for my desk. The colors are amazing and it's so vibrant, I couldn't ask for more! 'Serafina' Pendant with Ribbon Necklace ($25.00) - This is such an awesome pendant! I love how the colors look and it's so lightweight that you won't be weighed down if you wear it! I wish it were available for sale in the shop, because I know some people who would love it. Serafina and the Black Cloak ($16.99 Hardback/$7.99 Paperback) - The book that I received is actually the Advance Reader Copy, because this book isn't set to release until June 14th! I won't give you too much info on the book, because I hate book spoilers, but I will say that this is such a fun book to read. It's not super long, but I love the history of it. It's aged for 9-12, but I thoroughly enjoyed it. The history in the book is great and it's a book that parents could feel completely comfortable sharing with their kids. 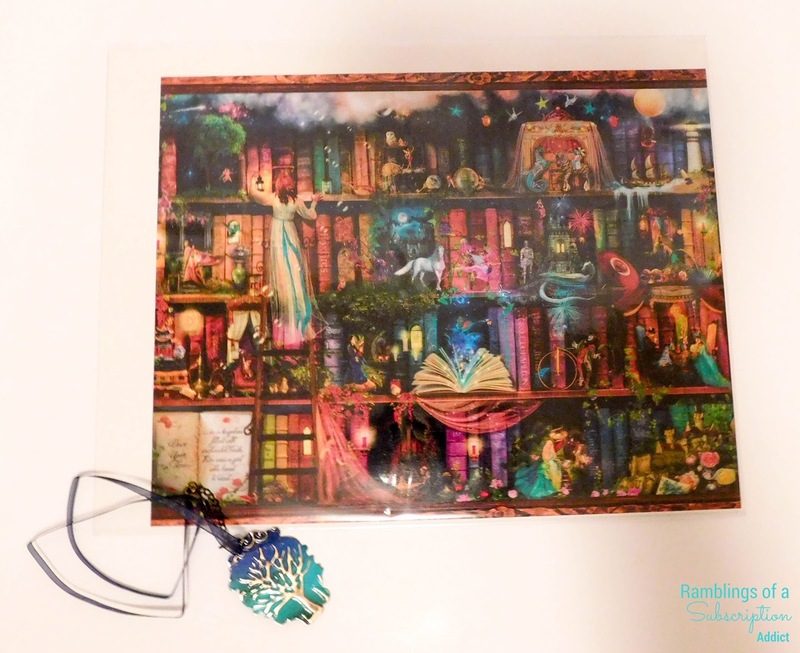 Matching Bookmark and Button ($10.00?) - These two items were sent courtesy of the author, so I guessed on the value. 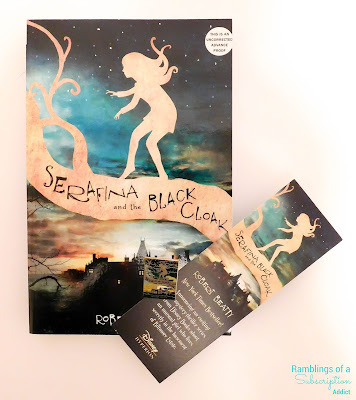 As I mentioned before, I love bookmarks and I really like that this one matches. The button will go great with all of my other ones I get from various boxes, and I love the matching design! This box is valued at my estimated $64.54, which is over the box cost by a bit. I love the idea of the box and this first one hit it out of the park! I haven't found out when this box will be available, but you definitely want to subscribe to the newsletter to stay up to date!